There is an abundance of squashes and pumpkins on the market at the moment; the deep orange-fleshed varieties offer the best flavour and colour. To make the the pesto, put the walnuts, basil, garlic and salt in a liquidiser and coarsely blend. Add the cheese and blend again briefly, then transfer to a bowl. Gently cook the leek and onion in the butter in a thick-bottomed saucepan until soft. Add the squash and vegetable stock, bring to the boil, season with salt and pepper then simmer for 20 minutes. Blend in a liquidiser until smooth, then strain through a fine-meshed sieve. 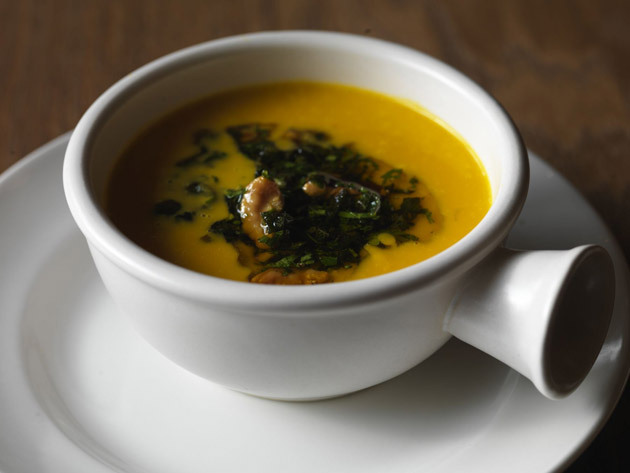 Re-heat the soup and adjust the consistency with a little vegetable stock or water if necessary and re-season with salt and pepper. Serve with a spoonful of the pesto on top. Do you have a passion for pesto? 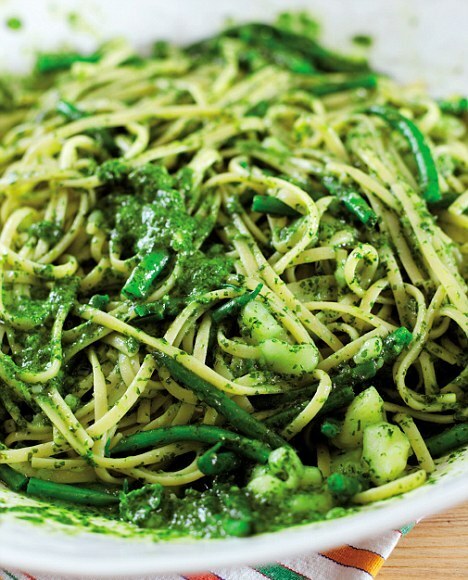 What’s your favourite pesto recipe, and is there any better way to eat it than with linguine and green beans? Energetic Italian grannies make their pesto by hand in a marble mortar, adding the basil leaves one by one. The result is the silkiest, smoothest pesto imaginable. Modern granddaughters are more likely to reach for the food processor, and the result is almost as good. Wash and dry the basil leaves. Heat a dry frying pan over a medium heat and toast the pine kernels lightly for 2-3 minutes. Set aside. If you’re using a mortar, pound the garlic with the salt to make a soft mush. Pound in the pine nuts, then work in the basil leaves, 2-3 at a time, with a circular movement of the pestle, until all is reduced to a silky paste. (The mixture can be frozen at this point). Work in the cheese, then beat in the olive oil with a wooden spoon until you have a thick, dense sauce. Add more or less oil depending on the texture you like. 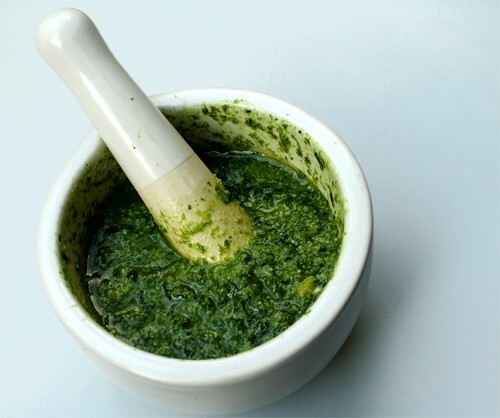 If you’re using a processor, drop all the ingredients in and blitz to a luscious green sauce. To serve, cook the pasta of your choice according to packet instructions. Ligurian cooks put a few small cubes of potato to cook with the pasta because the starch improves the sticking power of the pesto. Before dressing the pasta, dilute the pesto with a tablespoonful of pasta cooking water. To store the pesto, pour into a jar, float a layer of olive oil on top, cover and refrigerate for up to a week. The anchovies have been blended into the dressing with the capers so they act like a seasoning for the whole salad. Blend the ingredients for the dressing in a food processor (you can use some of the oil from the anchovies or tuna). Season well. Wash the new potatoes and cook them in salted water for 20 minutes. Drain, cool and cut into halves or quarters. Cook the beans in salted water for 5 minutes until slightly squeaky. Drain and cool. Boil the eggs for 5-6 minutes, cool quickly, peel and quarter. The yolks should be a little squidgy still. Separate the leaves from the little gem and arrange in a serving dish, ripping up the larger leaves. 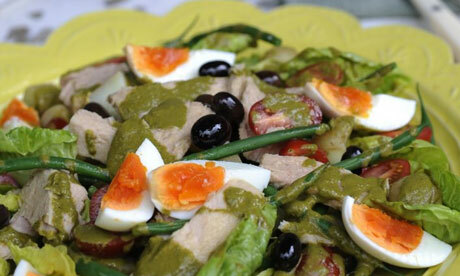 Toss the tuna chunks, cherry tomatoes, french beans, artichoke hearts and potatoes in the dressing. Transfer to the serving bowl and combine gently with the little gem. Top with the quartered eggs and olives, and sprinkle with shredded basil. Cook the fusilli pasta according to the pack instructions, or until al dente. Drain and refresh under cold water, and drain again. In a small bowl, whisk together the olive oil, red wine vinegar, lemon juice and dried oregano, and season to taste. Halve the cucumber lengthways and, using a teaspoon, scoop out the seeds, then cut into thick slices. 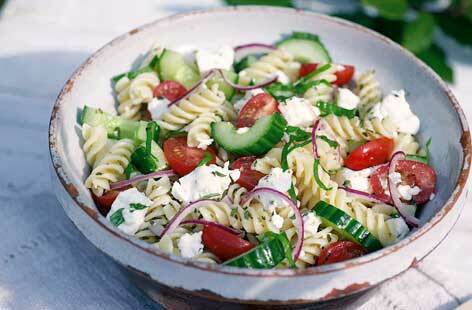 Add to the pasta along with the crumbled feta cheese, red onion, tomatoes and fresh basil. Pour over the dressing and gently toss. Season and serve.